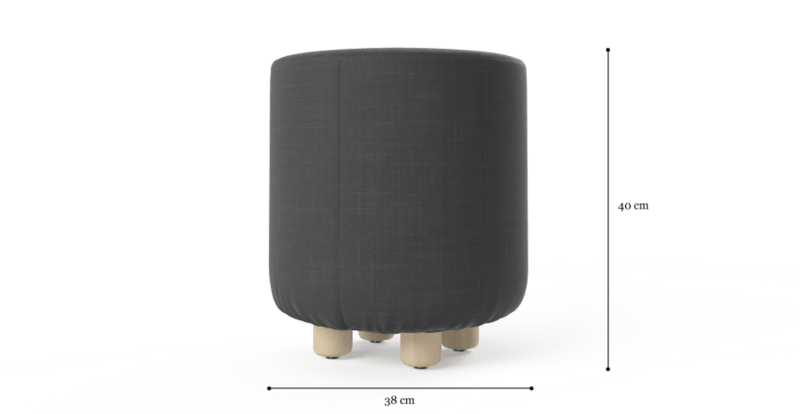 Simple and sophisticated, the Mim Small Round Ottoman is a chic and compact designer piece that brings an element of modern glamour to a space. The ottoman comes from the Mim Collection, which features a range of pretty and practical styles. With gentle lines and a curved silhouette, the Mim comes in a wide selection of shades to match any interior. The piece is upholstered in Brosa's linen-like Signature Premium fabric, or velvet made by local Australian fabric makers Warwick. Shop more ottoman styles from Brosa. Use the multi-functional Mim as an extra chair, footrest or coffee table around the home. Four natural legs have been finished with a clear lacquer to protect against wear and tear, and fitted with rubber tips to prevent movement. Loving care and craftsmanship have gone into the construction of each Mim Ottoman, which is built using the best materials by Brosa's team of makers. A strength tested frame and soft foam filling ensure comfort and quality. It was a long lead time, but I was aware of this when I ordered them. Product was excellent. Good service, good quality, good price!! Great customer service, love my products and great prices. Quality of product and great customer service from Rebecca. See, touch and feel our fabrics used on our Mim Small Round Ottoman. For Free! Simply select up to 3 fabrics and add them to your cart. Delivery is on us.